Several boutique amps, cabinets and effects models have been added to the latest version of the AmpliTube Custom Shop. Version 3.11 includes the Maz 18 Jr and Z Wreck amplifiers plus associated 1X12 Maz and 2x12 Wreck cabinets from Dr Z, the Fulltone OCD overdrive pedal and the Seek Wah and Seek Trem from Z. Vex. The update also includes 64 and 32-bit AAX compatibility, meaning AmpliTube can now be intergrated with the latest versions of Pro Tools. For more information visit the official AmpliTube website. IK Multimedia, a pioneer and global leader in music-creation software, mobile apps and music-making hardware, announces a new version of AmpliTube Custom Shop (version 3.11), its full-featured guitar-and-bass multi-FX application and plug-in for Mac/PC. The new release includes new gear models from several of the hottest boutique manufacturers on the market today, including Dr. Z Amplification, Fulltone, and Z.Vex effects, which will be available for à la carte purchase from the online store integrated in AmpliTube Custom Shop. The new version also adds 64 and 32-bit AAX (Avid Audio Extension) compatibility. As a result, AmpliTube now integrates seamlessly with the latest versions of Avid Pro Tools®. 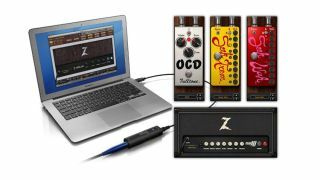 The new models include two amps from Dr. Z Amplification. One is the MAZ 18 Jr., which was originally designed as a plug-in-and-play amp for studio musicians who wanted a quick way to dial up fabulous tone. It features a perfectly balanced design with an all-tube preamp along with power and rectifier sections that harmoniously produce a smooth top end and tight bass response with tons of headroom. A model of its matching 1x12 MAZ cabinet is available as a separate purchase. Also from Dr. Z is the Z Wreck amp, a collaboration with the late Ken Fischer of Trainwreck Circuits and country superstar Brad Paisley, who has used one for years. It provides an unmatched level of touch response and tone, and can deliver everything from Liverpool to rock to twang. Its all-tube design gives it warmth, crunch and growl at different volume levels, and provides voicing like no other amp in its class. The 2x12 Z Wreck, a model of the amp's matching cabinet, is available for purchase, as well. The Fulltone OCD® overdrive pedal was designed to give players exactly what classic all-tube amplifiers provide when cranked up: sweet, full overdrive complete with multiple complex harmonics and overtones. The touch response rivals what you'd get on a tube amplifier - alter your attack or back off on your volume and you'll hear the OCD respond. The OCD lives up to its name when it comes to full attention to detail, and can truly be called the king of overdrive pedals. Also new are two officially certified creative effects from Z.Vex Effects: Seek Wah™ and Seek Trem™. These two stomps offer full control over the timing and level of wah and tremolo effects, respectively, over a sequence of 4, 6 or 8 steps, providing players with a new sonic palette of rhythmic effects, and non-traditional control over classic effect types. Each effect has eight "control" knobs, which allow players to adjust the amount of the effect at the marked position, and offer full control over tempo, number of "slices" and blending. Tempo can be controlled by the host clock or adjusted independently giving players creative flexibility. AmpliTube Custom Shop allows for purchase of individual gear models or collections for the AmpliTube platform. It's stocked with over 275 models from the world's top gear manufacturers including Fender®, Ampeg® Orange® Soldano™, Seymour Duncan™, Jet City™, Carvin®, Morley®, T-Rex™, Gallien Kruger®, among others - and now Dr. Z® Amplification, Fulltone® and Z.Vex®. Players can demo fully functioning models for a period of three days, making the Custom Shop the ultimate "try before you buy" experience. For new users AmpliTube Custom Shop is a fully functional free download available at the IK Multimedia site. Plugging a guitar or bass into a Mac or PC is a breeze with IK's range of audio interfaces designed specifically for guitar/bass players: The new iRig HD provides high quality D/A conversion for iPhone, iPad, iPod touch and Mac. The StealthPedal audio interface and MIDI controller is a wah-style controller pedal and interface that allows players to control software knobs, buttons and parameters from the floor with familiar ease. The StealthPlug is a 1/4"-to-USB interface cable for Mac/PC. To access the new gear models in the AmpliTube Custom Shop, users need to download AmpliTube version 3.11, which is a free update for current AmpliTube 3 owners, and is available for Mac/PC. The gear models in the Custom Shop are sold using Gear Credits and are priced between 5 and 30 credits each. Gear Credit Packs start as low as $19.99/€15.99 (for 20 credits) and go up to $499.99/€399.99* (for 1000 credits).